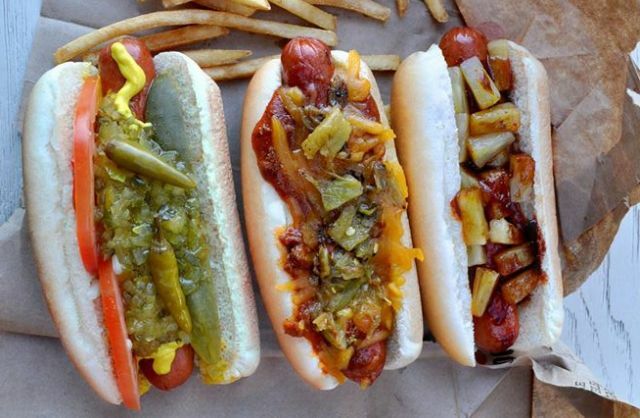 Wienerschnitzel looks to offer more localized flavors with the launch of the new "Hot Dogs From Around the USA" menu featuring a trio of hot dogs, each representing a different city in the US. Representing Hatch, New Mexico is the new Green Chile Chili Cheese Dog. It starts with an Angus Beef Dog in a steamed bun and tops it off with the chain's signature chili, shredded cheddar cheese, and Hatch Vally green chilies. It carries a suggested price of $3.49 (may vary). For Maui, Hawaii, there's the new Blazin' Teriyaki Pineapple Dog. It takes the Angus Beef Dog in a steamed bun and adds Blazin' Teriyaki sauce and pineapple chunks. The suggested price for the hot dog is $3.19. Finally, from the regular menu, there's the Chicago Dog, an Angus Beef Dog in a steamed bun along with tomato, onions, a pickle spear, relish, sport peppers, French's mustard, and celery salt. You can pick one up for $3.19. The limited-time menu is available through April 30, 2017 at participating locations.